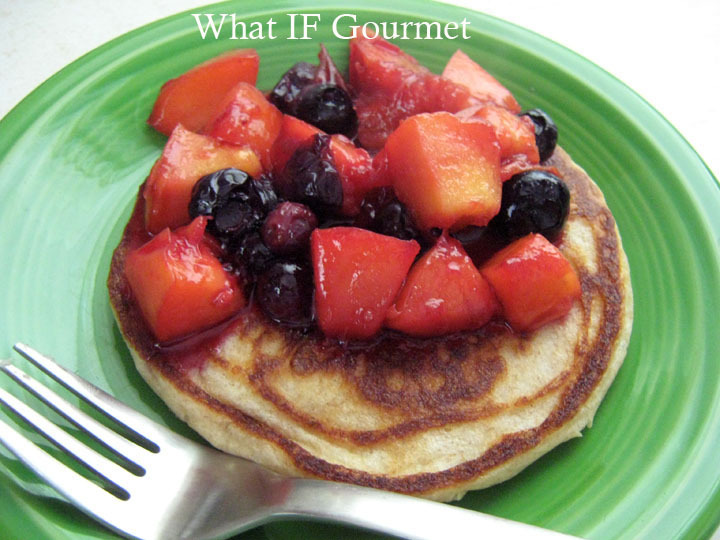 Vanilla coconut pancakes with blueberry nectarine compote. My basic formula for delicious pancakes that won’t trigger an attack of autoimmune inflammation (or put me and the Midwestern Gentleman into a lethargic sugar coma) is a simple one: wholegrain flours with no sugar in the batter, and fruit compote toppings that combine anti-inflammatory ingredients with just a hint of natural sweeteners. As I’ve mentioned before, our “Pancake Sunday” breakfasts are sweetly satisfying, but also provide us with healthful fuel for an active day. The basic recipe below works with a variety of flours. The thick (very thick!) buttermilk batter results in light, fluffy, moist pancakes every time. Since gluten formation is the enemy of pancakes — making them tough and rubbery instead of light and fluffy — experimenting with gluten-free, wholegrain flours like buckwheat doesn’t pose a problem. If you don’t have a large griddle, I recommend having multiple pans and burners going so you can cook more pancakes at once. It’s more hardware to clean up, true, but you also won’t spend an hour standing over the stove when what you really want to do is relax over a plate of pancakes, a cup of coffee, and your favorite news sources. At least, that’s my Pancake Sunday philosophy… but then, the Gent washes the dishes! Rosemary granola pancakes with coconut manna (a nut butter made from whole coconut) and pear fig-balsamic compote. Wholegrain Rye. Rye is a low-gluten flour with a unique, almost tangy flavor that I love in pancakes. Whole Wheat. Whole wheat adds texture and a pronounced flavor to pancakes. 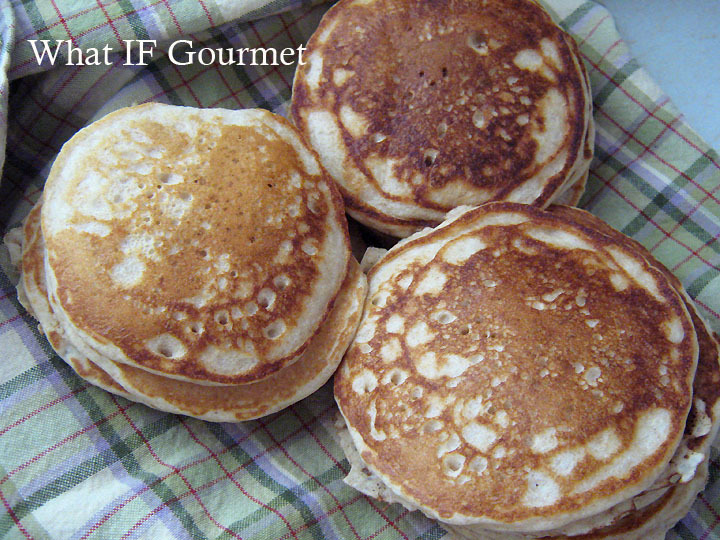 I love mixing it with rye flour (1:2) for particularly hearty, flavorful wholegrain pancakes. White Whole Wheat. White whole wheat has an almost identical nutrition profile to the more common hard, red whole wheat, but is softer in texture. This softer texture makes this flour an ideal replacement for all-purpose flour in most recipes. If you want to make wholegrain pancakes that taste more like traditional “white flour” pancakes (without that hearty, wholegrain taste) then this is the flour for you. You can also mix white whole wheat with heartier grains to lighten them up a bit. Wholegrain Spelt. Spelt is a low-gluten flour with a wonderful, complex flavor and light texture. It’s one of my favorite pancakes flours. Sometimes I use all spelt flour, but it also tastes great mixed with an equal amount of amaranth flour. Buckwheat (gluten-free). I fell in love with buckwheat bliny when living in Russia. In fact, my blog header is a photo of traditional Russian buckwheat pancakes (made by my friend Cathy) topped with salmon roe. Amaranth (gluten-free). Amaranth is technically a seed, not a grain, so this may be considered a grain-free flour. Amaranth is another of my favorite alternative flours, both for its taste and for its impressive nutritional profile. Quinoa (gluten-free). Like amaranth, nutritious quinoa flour is high in protein and has a delicate texture perfect for pancakes. Soy (gluten-free and grain-free). Soy adds a heavy, almost soggy, texture to pancakes, so I never use soy flour for more than one-quarter of the total flour. 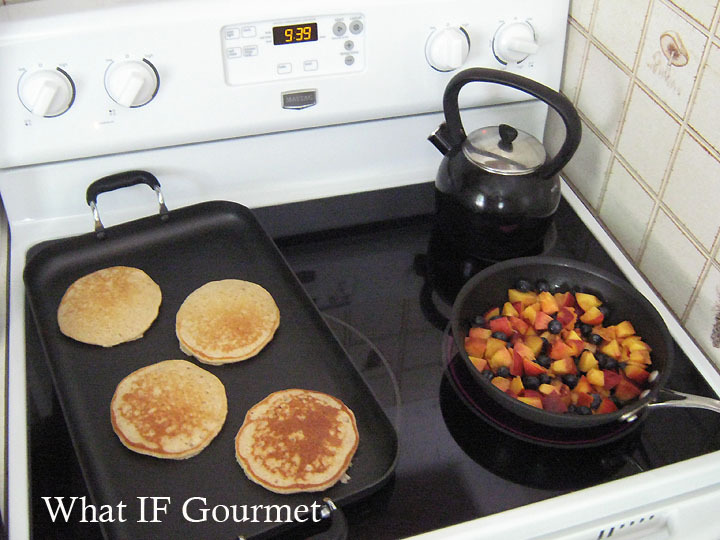 Heat a griddle over medium-low heat and lightly brush it with coconut oil. Whisk together the dry ingredients in a medium-sized bowl. Whisk together the buttermilk, eggs, and oil in a separate bowl until smooth. Add the wet ingredients to the dry and whisk together until just combined. Don’t try to beat out the lumps, or you will overwork the batter and the pancakes will be tough. The batter will be very thick. Ladle the pancake batter onto the griddle, and spread it out a little with the back of the ladle if necessary. Cook until the center is bubbly and the edges look dry. Flip and cook for another minute on the other side. The pancakes will be thick, so you may need to lower the griddle temperature to cook them all the way through. Makes about a dozen 4 – 5 inch pancakes. Leftover pancakes keep very well in the refrigerator or freezer. 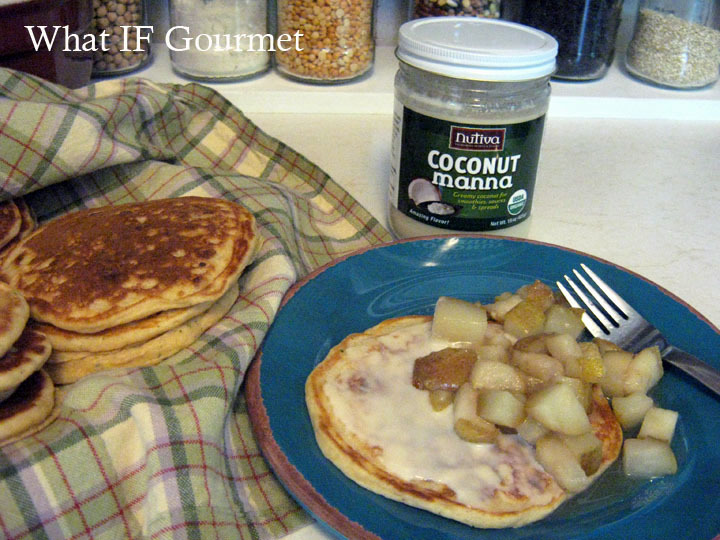 Vanilla-Coconut Pancakes: 1/4 cup unsweetened, shredded coconut + 1/2 tsp vanilla extract or vanilla bean paste. This is our absolute favorite, go-to combination. Chai Spice Pancakes: 1/2 tsp vanilla extract or vanilla bean paste + 1/2 tsp ground cinnamon + 1/2 tsp ground ginger + 1/4 tsp ground cardamom. 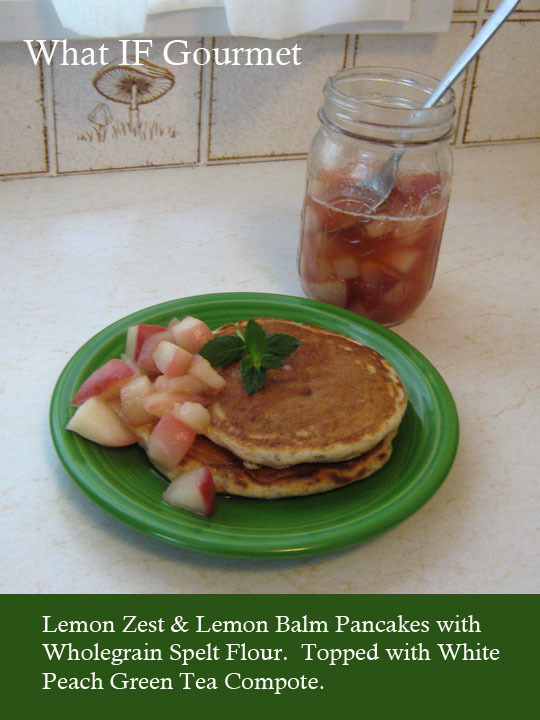 Lemon-Herb Pancakes: (this tastes especially nice with wholegrain spelt flour!) zest of 1 lemon + 2 Tbsp minced lemon balm. Rosemary Granola Pancakes: 1 Tbsp finely minced fresh rosemary, added to the batter + 1 Tbsp granola per pancake, sprinkled onto the pancake batter just after ladling it onto the griddle. Strawberry-Balsamic: 2 cups fresh or frozen strawberries + 1 Tbsp honey or agave nectar + 1 Tbsp balsamic vinegar. Simmer about 10 minutes. 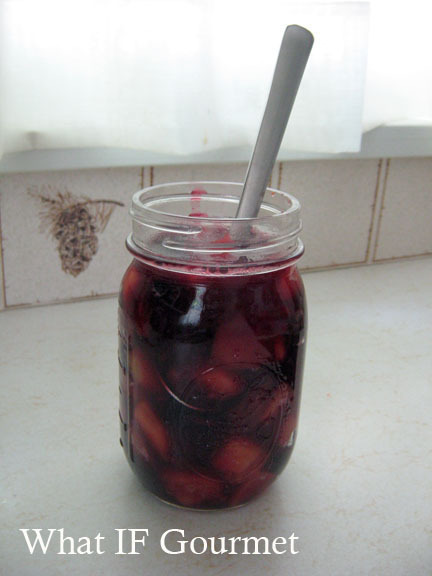 Blueberry-Nectarine Compote: 4 nectarines, pitted and chopped (do not peel) + 2/3 cup fresh or frozen blueberries + juice of 1 lemon + 1 Tbsp honey or agave nectar. Simmer about 10 minutes. White Peach Green Tea Compote: click here for the recipe. Cinnamon-Apple (or Pear): 3 small apples or pears, cored and chopped (no need to peel) + juice of 1 lemon + 2 Tbsp honey or agave nectar + 1 tsp ground cinnamon. Simmer about 10 minutes, until fruit is soft and juices are slightly thickened. 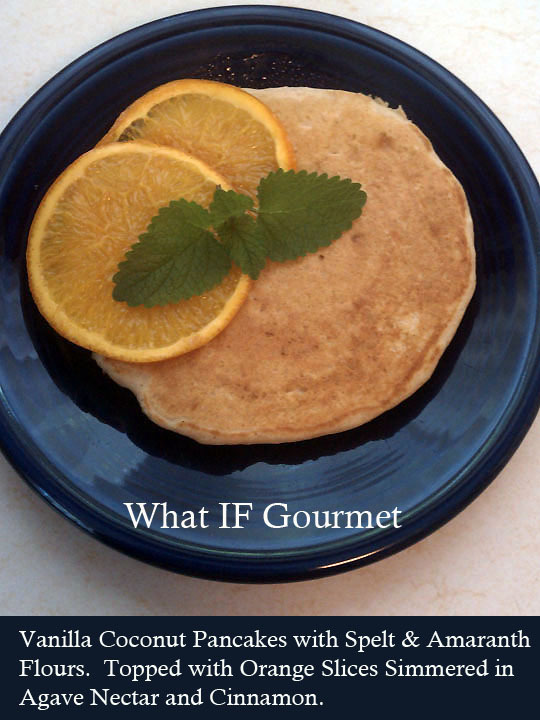 This entry was posted in Anti-Inflammatory Ingredients, berries, Breakfast, citrus, coconut oil (virgin/ unrefined), fruit, ginger root, Gluten-free, green tea, herbs, Nut-free, Recipes, seeds, spices, Vegetarian. Bookmark the permalink. Grain-free is such a challenge, but it does seem to be a good choice for some people. 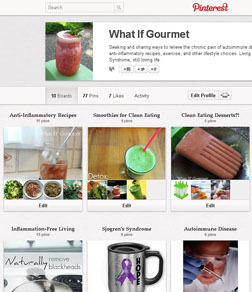 Thanks for following my Pinterest boards! Have you ever read the blog Anja’s Food 4 Thought? (http://www.anjasfood4thought.com/) She is also grain-free and posts wonderful recipes you might enjoy experimenting with, too. I want your griddle, and your stove, and for you to invite me to breakfast. I’m more of a waffle person but it seems like this info is transferrable to waffle batter. Thanks for all the info on the different grains, I’ll have to try some of them. I’m totally in love with that griddle. The stove is indeed a huge improvement over the Amana Radarange Plus, ca.1977. The Gent would also like waffles (and I agree, the batter formula would probably translate quite well) but we don’t have a waffle iron. It’s on our list of non-essential appliances to maybe acquire someday. However, a Vitamix blender still tops the list… oh, the smoothies I could make in that thing!